On Friday March 10, TAAF2017 has finally started! The first program was ‘Short Animation Competition slot 1’ at 9:45am. The festival director Mr. Koji Takeuchi declared the start of TAAF2017 and the four days period of competition began. At the first floor of WACCA Ikebukuro where the information counter is, a stop motion workshop area was made by Mr. Hiro Minegishi, the representative Stopmotion animator, Dwarf studios which is famous for Domo-kun the mascotte character of NHK. It is an attempt to show how ‘the live animation making’ is processed. At the 2nd floor of WACCA Ikebukuro, various references of anime were exhibited by the winners of ‘Achievement Award’, which is almost one of the annual events at TAAF now but it is yet very rare and a special occasion to open to the public. 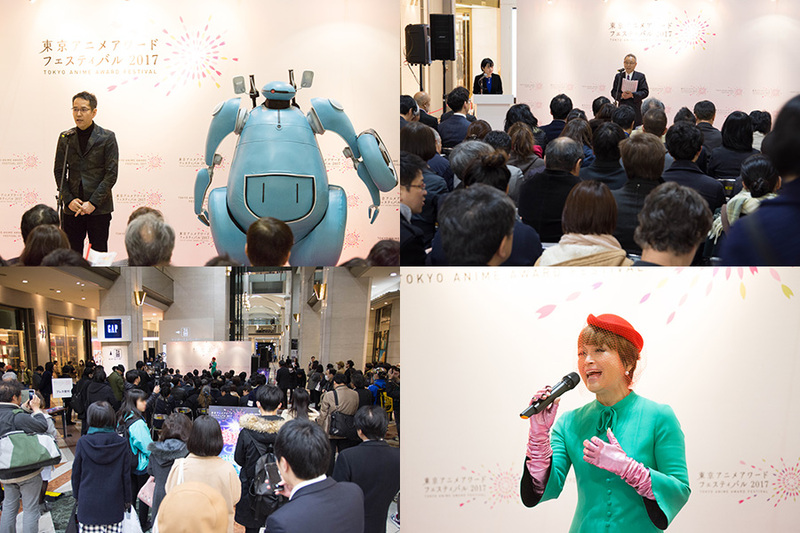 At 18:00, we held the opening ceremony at the Metropolitan free passage on the first floor of Lumine. There were many kinds of people gathered at the venue including Mr. Kenji Kamiyama, the director of the opening film ’ANCIEN AND THE MAGIC TABLET’ , Mr. Yukio Takano the mayer of Toshima district, Ms Yoko Maekawa, and other local people from Ikebukuro who support the city, and the competition nominees who make the future of animation. With the tape cutting, the start of TAAF2017 was clearly declared. Especiatlly, Ms. Yoko Maekawa kindly performed her singing, and her master piece ‘CUTY HONEY’ was run at the encore. Even the passengers on the street stopped and listened to her beautiful singing. At Ikebukuro HUMAX CINEMAS, we had ‘Nordic special – the animation of Northern Europe. ‘Pikkuli’ came to visit the program, and the secret of ‘who is inside’ was disclosed as a nice surprise. Shinbungeiza theater, the introduction and explanation about the competition was given by the first juries which invited many questions by curious audience. At CINELIBRE Ikebukuro, the opening film of ‘ANCIEN AND THE MAGIC TABLET’ was shown and Mr. Kamiyama the director went onto the stage and spoke about his works with absolute passion! TAAF2017 has finally began. The ticket is still available at each theater on door, so please come and visit Ikebukuro to join us!